Many people feel they must get a young bunny when they choose a companion rabbit, but this may not be the best option. Living with an adult (over a year old) or older rabbit (over six years old) has more benefits than you think. Baby rabbits – like puppies and kittens – are a lot of work, especially for first-time caregivers. They are very energetic, playful and more destructive than most adult rabbits. Because of their small size, they can get into all the nooks and crannies, such as behind the sofa or under the garden shed. Adults are calmer and easier to manage, especially if they’re neutered. Many people think that if they buy a baby rabbit and handle him often, he will enjoy being picked up and mothered. This is rarely the case, as most baby bunnies are far too busy dashing around and exploring their environment to be held for long. Generally speaking rabbits don’t like to be picked up and prefer to sit next to you to be cuddled. Rabbits of any age can become tame and affectionate if they are petted on their own terms and you are willing to put in the time. People are attracted to baby rabbits because they are small and cuddly. Babies may look very cute, but consider this: rabbits cannot be separated from their mothers until they are two months old, and by the time they are 4 or 5 months they’ll have reached adult size and won’t look like babies anymore. Baby rabbits are often bought for young children so “they can grow up together”. However a child won’t know how to look after a baby bunny and may hurt him. It is unreasonable to expect a child of any age to take responsibility for the care of a pet. Rabbits are physically delicate animals and a poor choice for children under 10 years old. If dropped, a rabbit could break his back or hurt his paws, which are not padded like those of cats and dogs. If the rabbit is considered a family pet and play with the bunny is supervised, then a child can grow up with a rabbit. A large, adult rabbit will command the most respect from a child. Adult rabbits who are neutered or spayed are easier to litter-train. Like puppies and young humans, baby rabbits can’t be expected to have good control of elimination. Even when such control is gained, they may be too busy chewing, digging and running about to be bothered to return to the litter tray. When a rabbit reaches sexual maturity (3-6 months), he may begin to spray urine and appear to lose his litter-training. This is the time to have your rabbit neutered or spayed. In the first year of life, most rabbits go through some personality changes. By adopting an adult rabbit you’ll be able to tell his character as well as his size. Rescue centres are full of adorable adult rabbits who are just waiting for their chance to be rehomed. Some of them may already be neutered, vaccinated and litter-trained. Please see The Bunny Hopline for details of your local rabbit shelter. understands that when bunny matures he will need to be neutered and isn’t put off when the bunny sprays urine or wants to mate. S/he knows that neutering will solve the problem. Senior bunnies (over six years old) may move about a little slower and sleep a lot more, but they retain their wonderful personalities and good habits. If you can offer an older bunny a home where he can live however long he has left, please search The Bunny Hopline. Rabbits can live 7-10 years or longer. Older rabbits may require more veterinary care and it is essential that those who adopt them are fully committed to paying for any treatment they might need. 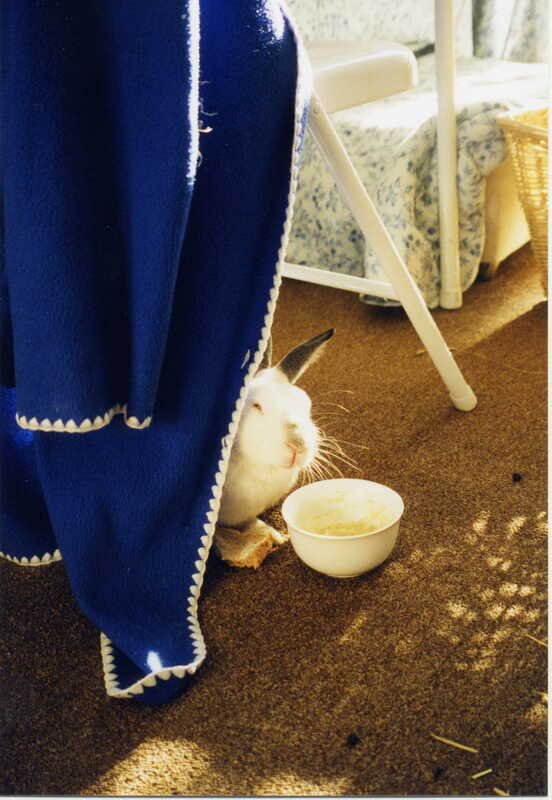 Six year-old bunny Benjamin arrived at our foster home in February 1998. Benjamin spent the first year of his life as a children’s pet, and when they lost interest, he was often left without food or water. Eventually a neighbour offered to take him, even though she could not care for him properly. Benjamin spent the next five years living on a garage rooftop without any grass or company. Because his carer was not well, she had to depend on other people to buy rabbit supplies or take Benjamin to the vet. As a result Benjamin sometimes lived on stale food and went without veterinary care. When he was 6 years old the lady decided she didn’t want him anymore and sent him by cab to our foster home. Benjamin had been described as a pure white dwarf lop, so we were surprised to see a handsome grey and white up-eared bunny. Being gentle and sweet, several people wanted to adopt him, but changed their mind when they learnt about his age. By chance we discovered our rabbit Carolina was in love with Benjamin, and leaped for joy whenever she was near him. Benjamin too was smitten with her and would follow her around like a puppy. Faced with this budding love story, we just had to adopt Benjamin as a friend for Carolina and he moved into our home as a free-running house rabbit. Benjamin quickly learnt to use a litter tray and being a senior bunny he is quiet and easy-going. He is completely devoted to Carolina and they are usually found snuggled up together under a chair or behind the sofa. On warm days he likes to go out in the garden to dig up the flowerbeds and sit in the sunshine. Benjamin has a sweet tooth and always begs for his Digestive in the mornings. When we return from the supermarket, he inspects all the bags hoping to find some bread or biscuits. Benjamin spends his evenings being cuddled in front of the television and a few months ago he started sleeping on our bed. He is wonderful to have around – a friendly, good-natured bunny with a warm personality. We are very fortunate to share our home with him and be able to provide the love and stability he deserves.